The expanding full metal jacket, or EFMJ, bullet is pretty unique. It was designed to offer shooters of all types an alternative to hollow points, with a nice blend of stopping power combined with little to no over-penetration. This makes the EFMJ the perfect choice for concealed carry and home defense ammo, because the odds of causing unwanted collateral damage to property or harming people on accident are lower than when using a standard bullet. The EFMJ is patented by Federal Premium. 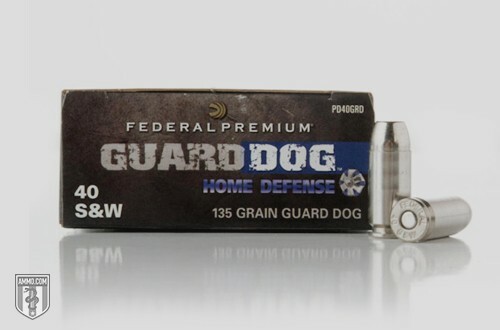 They sell it in a few of their lines, but the Guard Dog line of pistol ammo seems to be the most popular. Hollow points were made to expand almost instantly when they hit something, and mushroom at the end of the bullet. This not only attempts to eliminate over-penetration, but also increases the wound cavity to devastating proportions. While typically meant for pistols, there are HP bullets available for rifles and even shotguns (slugs). The biggest issue with hollow points is the lack of consistency. Some brands do what they’re intended to do, while others can still go through a target and cause damage to whatever is behind it. While this is not as frequent as it is with regular bullets, it’s still an issue. The EFMJ bullet functions just like a hollow point, but there’s a huge difference in the bullet itself – it’s not hollow at all. It’s what’s known as a “soft-tip,” and what this gives you is amazing uniformity with every shot. The way the end collapses in on itself and expands the sides functions extremely well. Some hollow point brands can fan out unpredictably, so this solves that issue if it’s a concern for you. Federal Premium put effort into this feature to give people a suitable alternative when hollow points started getting banned in various areas. The Federal EFMJ is currently offered in 9mm, .40 S&W, and .45 ACP. When looking at the specifications, one will note that the bullet weights are a bit on the light side and the velocities are a bit faster than the average load for the respective caliber. This is beneficial in two areas – one is that the lighter bullet weight generates less felt recoil, and the other benefit is that the high velocity helps the bullet to expand faster and more reliably. So what’s better in the grand scheme of things? The answer will change depending on who you ask, what gun they use, and a dozen other factors. The bottom line is this is a great alternative to hollow points and is a decent ammo for home defense and your concealed carry weapons. It won’t get you in trouble if hollow points are banned where you are, and it performs almost identically in terms of power and penetration.